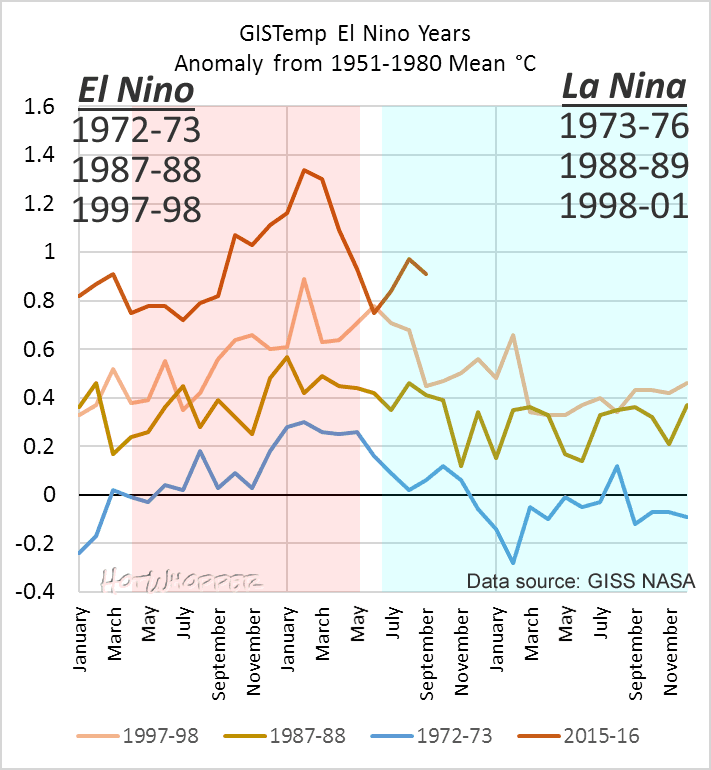 You can see the global mean temperature trend by month in the chart below, for the strongest El Niño years since 1950, which were followed by a La Nina. I've included the 2015/16 period for comparison. 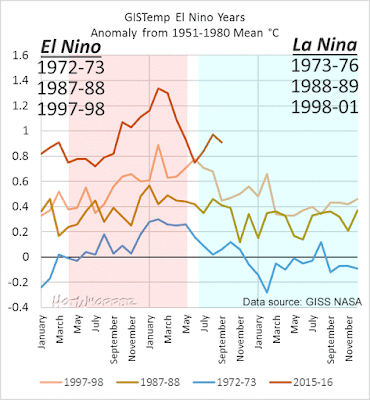 NOAA has put back the La Nina watch. The BoM ENSO update is still on watch status (it never came off). Last month it was again hot almost everywhere. Much of the northern hemisphere was very hot. Part of Antarctica is extremely hot and part is rather cool. There was also a cool patch over south-west Western Australia, which IIRC had the coldest September ever. The cooler patch south of Greenland is still there, too. It's just been pointed out to me that the latest revisions put June 16 temperature (0.75 C) below that of June 98 and June 15 (equal 0.78 C). That means that there were now eight months in a row of "hottest" - from October to May inclusive. Then another three hottest months from July to September. I'll bet that there are no howls of protest from the Denialati about revisions that take 'record' months (or other warming signs) out of the, erm, record. Of course a pedant would point out that such record events are in large fashion arbitrary subdivisions of time. As a counting and categorising species though it's an entirely natural thing to do, but perhaps it's salient for the punter on the street to keep in mind at least the general import of the statistical aspects of the underlying phenomena - both the fundamental signal/forcing that's driving the trajectory, and the superimposed modifiers that provide some of the 'noise' in the system. The message that comes out at the other end once one accounts for what's actually happening is - "uh oh..."
Well, here's kind of a bummer. 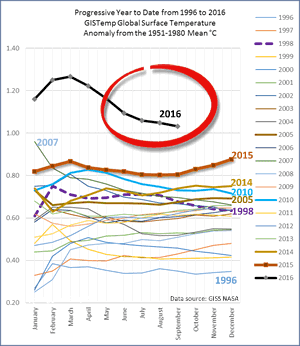 If you look at the GISS data now, you will see that June 2016 no longer holds the June record. 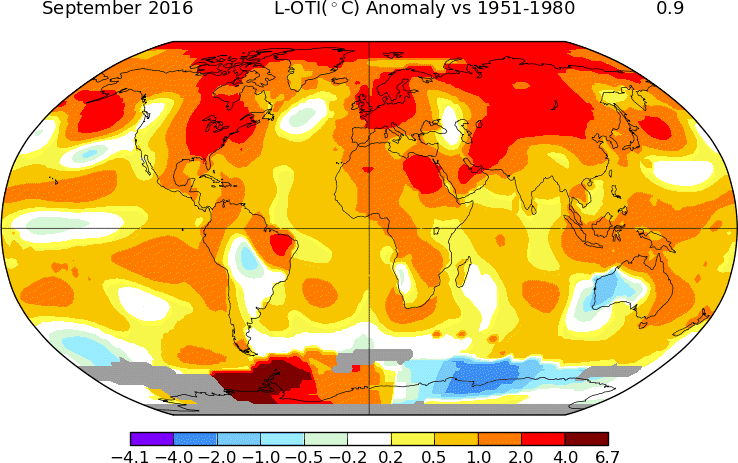 June 2016 currently (as of Oct. 17th 2016) reads 0.75 deg. 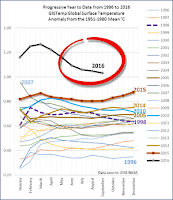 C., while June of both 2015 and 1998 have anomaly values of 0.78 deg. C. I think this is either because the values vary by .01 to .02 deg C each month due to homogenization of the data or possibly because June was adjusted downward a little after the initial value was reported. A very minor thing, but it’s liable to be noticed and pointed out as a big hairy deal if it is not acknowledged now. I see somebody pointed that out to you while I was composing my response (and was interrupted before I could post). 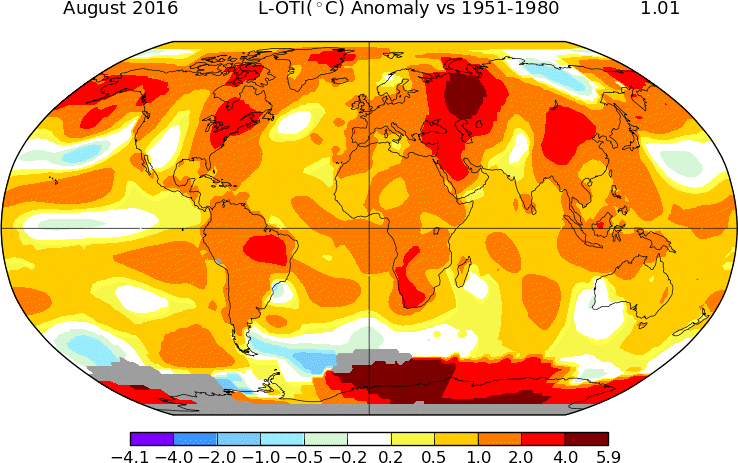 If the anomalies for the next three months stay around 0.9C, we'll hit a full 1C average anomaly for the year. For the seasonal year (Dec through Jan), it would just take 0.78C anomalies for the next two months. I can picture global warming den... sorry, 'skeptics' keeping a low profile until it becomes clear that 2017 will be cooler that 2016. And then, cries of 'El Niño!' 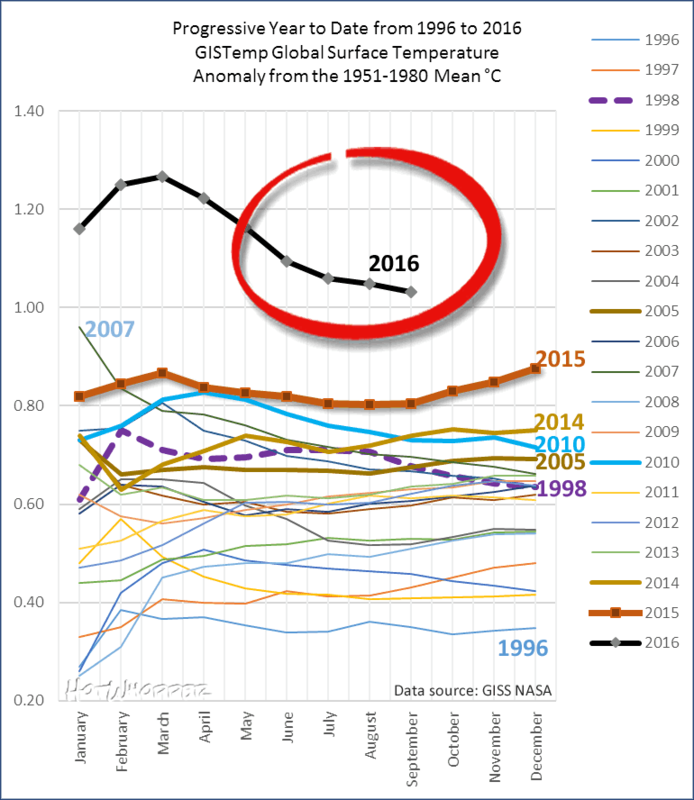 and 'No warming since March 2016!' will ring out from their aging, shrunken ranks. "We've had the coldest September since records started at the Mt Lawley (Perth metropolitan) station in 1994." Needless to say, the West Australian letters to the editor had a few contributions from people who think that Perth's September temperatures negate the entire temperature records of the whole planet. There was even a 'no warming for the past 18 years ...' recently.